A team of materials science researchers, including professor Paul Braun, studied how heat flows across an interface at an atomic level. The researchers demonstrated that a single layer of atoms can disrupt or enhance heat flow across an interface. Their results are published this week in Nature Materials. Improved control of heat exchange is a key element to enhancing the performance of current technologies such as integrated circuits and combustion engines as well as emerging technologies such as thermoelectric devices, which harvest renewable energy from waste heat. However, achieving control is hampered by an incomplete understanding of how heat is conducted through and between materials. "Heat travels through electrically insulating material via 'phonons,' which are collective vibrations of atoms that travel like waves through a material," said David Cahill, a Willett Professor and the head of materials science and engineering at Illinois and co-author of the paper. "Compared to our knowledge of how electricity and light travel through materials, scientists' knowledge of heat flow is rather rudimentary." One reason such knowledge remains elusive is the difficulty of accurately measuring temperatures, especially at small-length scales and over short time periods - the parameters that many micro and nano devices operate under. Over the past decade, Cahill's group has refined a measurement technique using very short laser pulses, lasting only one trillionth of a second, to probe heat flow accurately with nanometer-depth resolution. Cahill teamed up with Paul Braun, the Racheff Professor of Materials Science and Engineering at the U. of I. and a leader in nanoscale materials synthesis, to apply the technique to understanding how atomic-scale features affect heat transport. "These experiments used a 'molecular sandwich' that allowed us to manipulate and study the effect that chemistry at the interface has on heat flow, at an atomic scale," Braun said. The researchers assembled their molecular sandwich by first depositing a single layer of molecules on a quartz surface. Next, through a technique known as transfer-printing, they placed a very thin gold film on top of these molecules. Then they applied a heat pulse to the gold layer and measured how it traveled through the sandwich to the quartz at the bottom. 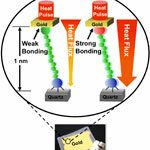 By adjusting just the composition of the molecules in contact with the gold layer, the group observed a change in heat transfer depending on how strongly the molecule bonded to the gold. They demonstrated that stronger bonding produced a twofold increase in heat flow. "This variation in heat flow could be much greater in other systems," said Mark Losego, who led this research effort as a postdoctoral scholar at Illinois and is now a research professor at North Carolina State University. "If the vibrational modes for the two solids were more similar, we could expect changes of up to a factor of 10 or more." The researchers also used their ability to systematically adjust the interfacial chemistry to dial-in a heat flow value between the two extremes, verifying the ability to use this knowledge to design materials systems with desired thermal transport properties. "We've basically shown that changing even a single layer of atoms at the interface between two materials significantly impacts heat flow across that interface," said Losego. Scientifically, this work opens up new avenues of research. The Illinois group is already working toward a deeper fundamental understanding of heat transfer by refining measurement methods for quantifying interfacial bonding stiffness, as well as investigating temperature dependence, which will reveal a better fundamental picture of how the changes in interface chemistry are disrupting or enhancing the flow of heat across the interface. "For many years, the physical models for heat flow between two materials have ignored the atomic-level features of an interface," Cahill said. "Now these theories need to be refined. The experimental methods developed here will help quantify the extent to which interfacial structural features contribute to heat flow and will be used to validate these new theories." 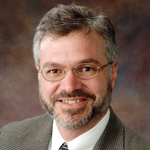 Braun and Cahill are affiliated with the Frederick Seitz Materials Research Laboratory at the U. of I. Braun is also affiliated with the department of chemistry and the Beckman Institute for Advanced Science and Technology. The Air Force Office of Scientific Research and the National Science Foundation supported this work. The paper's co-authors include materials science and engineering professor Nancy Sottos and her graduate student Meg Grady. Editor's note: To contact Paul Braun, call 217-244-7293; email pbraun@illinois.edu. 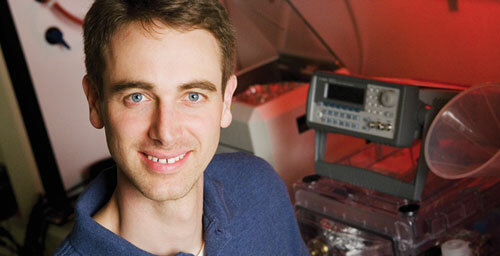 To reach David Cahill, call 217-333-6753; email: d-cahill@illinois.edu. To reach Mark Losego, call 919-513-3166; email: mdlosego@ncsu.edu. The paper, “Effects of Chemical Bonding on Heat Transport Across Interfaces,” is available from the News Bureau.